We are currently working on having my oldest memorize our phone number. He sometimes has issues with memorizing numbers, especially if they are not in the normal order. This also got me thinking about the emergency contact list that I have on my fridge. It's really for babysitters, but what if I were to fall down the stairs (trust me, it's a real possibility with my "gracefulness"), and my kids were my only hope? What would happen? I have my husband programmed into my phone, so Bernardo only has to unlock the phone and hold down one button to call him. I have other family members programmed too, but it's a lot to memorize and recall who goes with what number, especially in an emergency. 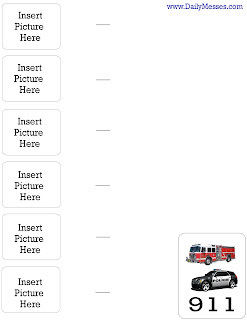 So, I created Picture Phone Cards. 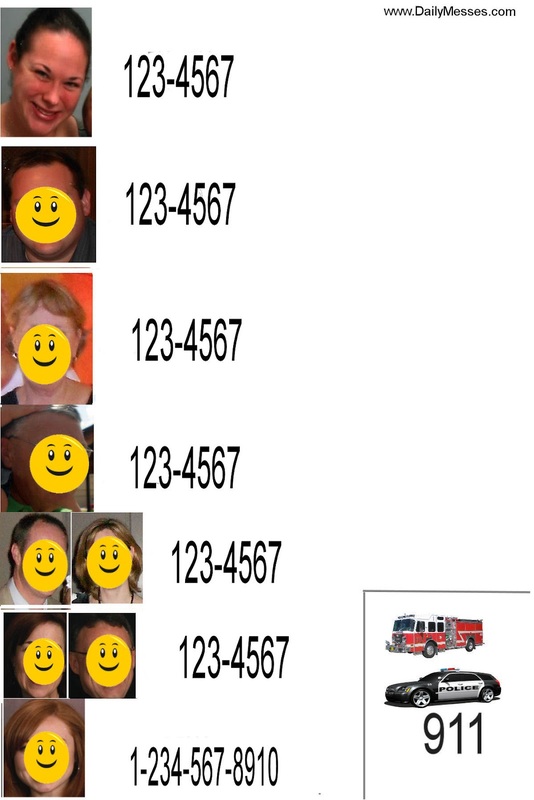 In a photo editing software, I placed pictures of our family members along with their phone numbers next to their picture. I also included a picture of a firetruck and police car with 911. I placed a big one on the fridge at his eye level on the side that is near the phone. I also laminated two 5x7 sized cards and placed one in the diaper bag and one in his school bag. The ones that are in the bags have $1.50 in quarters and a $1 bill with the phone card in a Ziploc bag. We're going on vacation soon and I realized that while these would be great for in town, he would have to remember to dial 1 and then the area code. I know there is no way a preschooler is going to remember that, and I can imagine his frustration when he tries to call someone and gets the "You must first dial a 1 or a zero and the area code. Please hang up and try again." recording. So, I created the Out of Town Picture Phone Cards. One is going into his travel backpack and one is going in his brother's travel backpack. I also created a small 3x3 card to fit in his shorts pocket. These also got laminated. Here's one you can print out, paste on your own photos and write in the numbers. I included one for in town and one for out of town. Good emergency contacts are usually people (family or non-family) you trust to take care of your child and to be there to help you out. We are lucky enough that we have a lot of family in town. If you don't, use close friends or neighbors that you would trust to take care of your kids if you had to run to the emergency room. Make sure to use a phone number where they can be reached at the most. For example, I put my husband's cell phone number instead of his work number because he almost always has his cell phone on him. Update: We went to the State Fair. At the security check, a State Tropper saw Bernardo's card with the quarters on the back. She loved it and thought it was a great idea!